The first step is to soak the seeds in tap water. Every seed species is put in a plastic glass and recovered with water for 24-48 hours. Usually viable seeds will fall to the bottom of the glass within 24 hours at room temperature. Empty seeds will be floating (Pinus, Abies, Picea, Torreya, Taxus, etc.). It is easy to cut some seeds to verify and then the floating empty seeds can be discarded. The worst thing is to put a label when the inscription will be erased once submitted to sunlight, rain and variations of temperature. Very few labels will resist such treatment over time. One of the best and cheapest solution is to engrave one plastic label with a soldering-iron. The inscription will last for ever, insuring that the sowing and future seedlings will be always identified. Second photo (April 2001) : final setting. Under the net about 1'600 tubes are awaiting germination of more than 40 different species of conifers. The choice of the material is very important. Many ornamental nurseries are using small pots to avoid using a lot of medium and to save place. Often the roots will be spiralling at the bottom of the pot and the result will be roots not fit to anchor well the future tree in the soil. The Keteleeria davidiana on the photo is even likely to strangle itself while growing... The roots were not spiralling at the bottom of the pot : the mess shown on the photo is the consequence of the use of a very small pot for a too long time, the plant being fed artificially. It is for this very reason that the Arboretum de Villardebelle is growing most seedlings in its own nursery using forestry material. When the germination occurs, the root is the first to emerge out of the seedcoat. This quite young Pseudotsuga macrocarpa seedling on the left is a very good example of the importance of the root before the seedling will emerge from the surface of the soil. The root is already 11cm long while the aerial part is only 3 cm high and the cotyledons are still not completely out of the seedcoat. In a small pot, the root will begin to grow horizontally and to spiral at this early stage. The best material is used by forest nurseries : tubes allowing air-pruning at their bottom. 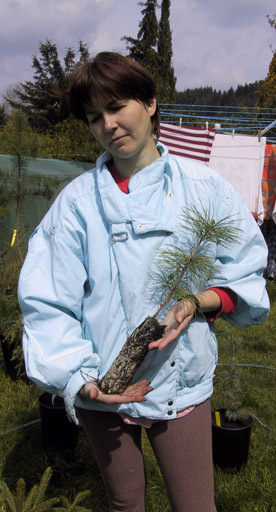 Here is (photos below) the result with a Pinus koraiensis grown already for 5 years in a plastic tube. The medium is composted pine bark. 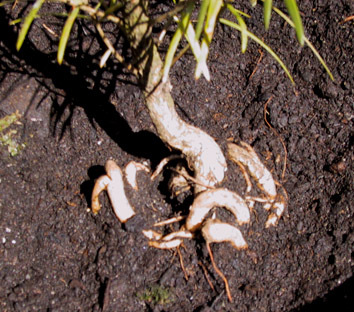 The roots are colonized by a mycorrhizal fungus (whitish on the photo). The roots are well formed and there should be no problem at planting time, nor in the future. The example shown on the picture is a multipot with 45 tubes. It will allow seedlings to grow for 1 year (fast growing conifers like Metasequoia, Cryptomeria, Cupressus, many Pinus species, etc.) or for 2 years (slow growing conifers like most Abies, Picea, Taxus, Juniperus and some Pinus species − aristata, balfouriana, longaeva). The photo shows 1 year old Cupressus abramsiana seedlings in the process of being repotted. 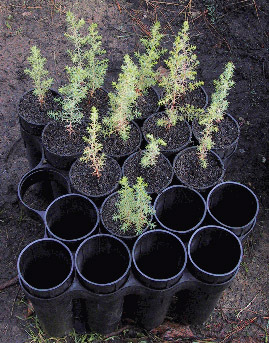 After one or two years − depending on the size of the plants − the seedlings are carefully retrieved from the multipots and repotted in larger tubes (here Deepots40). They are 25 cm deep (10 inches), allowing the roots to grow further down. The tubes are displayed on a tray with 20 places. These pots are also used to sow large seeds like Torreya or Pinus maximartinezii and Pinus torreyana. Some Cupressus abramsiana after repotting. Planted in the wild, the seedlings will be subject to many hazards. The most obvious hazard is represented by animals (mammals). Wild ones, such as rabbit, deer, wild boar, mouse (roots), as well as farm-animals like sheep and cows. Protection is mandatory, otherwise wild animals could browse many seedlings or young trees, and domesticated ones could destroy a whole plantation (as it already happened in Villardebelle - but not in the Arboretum). On the right of the picture a typical protection for seedlings. Held by 3 (sometimes 4 for bigger plants) stakes, a chicken-wire fence is protecting efficiently the seedling. The fence is one meter high and will keep away sheep, deer and wild boar (although sometimes the fence is pushed and completely deformed, but without harm to the small plant). Wild boars will uproot the freshly planted unprotected seedlings or bark the trunk of a tree. The seedling inside the fence is an Abies concolor. On the left of the picture is a 220 liters barrel to collect rain. The water will be used at the time of planting or in case of drought during the first year. With caution in this case, for mice will quite often be attracted by moisture and will begin to dig galleries under the seedling. The second type of protection is a black plastic net, like a tube, 1.20 meter high and 30 cm of diameter. This device fixed on a wood stake and hold straight with one or two metallic stakes does not only insure a protection against animals, but also against direct sunlight and wind. A microclimate will develop in the middle of the net. The result will be more healthy plants, as it became obvious looking at seedlings of the same species planted close to each other, one under the black net, the second surrounded by a chicken-wire fence. The leaves will be darker green (Abies numidica, Picea orientalis). On the picture, a small Pinus edulis seedling is to be seen through the net (look at the enlarged picture by clicking on the photo).